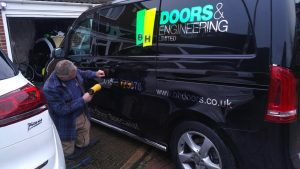 BH DOORS & ENGINEERING, Oxford; A complete new set of Van Graphics for my client’s Van. Trying a new approach from his usual livery decals – this time applying Avery Relective Green, 3M Fluorescent yellow and 3m Mirror series 7755SE for the text. The finish and look was remarkable against the black paintwork. on a customers Vito van, Dec 19th in Oxford.